Manchester Terriers - Lively And Affectionate Companions! 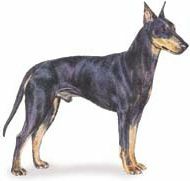 Manchester Terriers get their name from the City of Manchester in the north of England, where a breeding center was founded. Development of the breed is not clear-cut, but possibly the result of crossing with the Whippet, Black and Tan Terrier and the Greyhound. There are two sizes of the Manchester - standard and toy. Unlike most terriers, its coat is smooth and glossy. Ears may be seen either naturally erect ear, the cropped ear, or the button ear, though only the naturally erect ear is acceptable in the toy. He is an elegant looking dog with a lively and alert expression. The Whippet lines can be seen in his structure. During the 19th century, this breed was known as the most phenomenal rat catcher and still bears the nickname - rat terrier. He was also to be found in rabbit hunting and other field sports. Today, Manchester Terriers are mainly kept as a family companions. They are also quite often entered for conformation at dog shows. If trained, they can also do really well in obedience, tracking and agility trials. If you like a dog that doesn't needs hours of grooming, this is it. The Manchester has a smooth sleek coat that has almost no odor and requires a very modest amount of grooming. However, it is a dog that likes to be kept clean. A very intelligent breed that learns quickly and likes to please its master. Training needs to be consistent and firm to overcome their independent nature. Socialization should begin at an early age. Loyal, protective and affectionate, this dog makes a fine companion and alert watchdog. Sporty and agile, owners who enjoy running will find the Manchester a capable partner. They also have the potential to make you proud if entered into agility sports or obedience trials. This is a very lively breed that should receive a significant daily walk. If left alone too long or not exercised, he will get into destructive mischief! Manchester Terriers are not at all fussy about space and will easily adapt to an apartment or house. If there is an outside area to run, it will be greatly enjoyed by this energetic breed. Best if introduced and socialized with children from puppyhood. As always, it is recommended that, no matter what the breed, adult supervision is the best policy whenever pets and children are are interacting. The breed's clean habits and minimal care make this terrier a great companion for the elderly if exercise needs can be met. Covers breed history and characteristics, puppy selection, feeding, training, health care and behavior. Also has advice about preparing for a puppy, housetraining and potential puppy problems. Many color photos. What dog doesn't like tasty treats? Rover will be happy to do his training routines to get one or two of these delicious bites. Order your copy now and have a happy, well-behaved pooch in no time!